Given the glut of Batman books on the market, it's sometimes comforting (if not completely accurate) to consider what role each of them fills: Batman is the flagship or most superheroic of the books, Detective is the mystery stories, Dark Knight focuses on the villains, and so on. At one time, Grant Morrison's Batman, Inc. was the book that spotlighted Batman's international adventures or his allies from other countries. With the penultimate volume of Morrison's Batman saga, Batman, Inc. Vol. 1: Demon Star, however, I think we have to concede that Batman, Inc., now, is simply about Grant Morrison writing Batman. The international team is still here, but they're hardly the focus; rather Morrison's plot is all over the place, from Batman's past to the far future, with a rollicking story that more evokes Morrison's chaotic Batman and Robin than it does his philosophical Time and the Batman. Demon Star ends on a swift cliffhanger that doesn't make this first volume necessarily feel complete on its own, and what the reader learns in this volume isn't really new or different than what was established in the previous (pre-New 52) Batman, Inc. volume. In the push for a final "year" of Batman, Inc., Demon Star feels like filler, if still an entertaining read nonetheless. 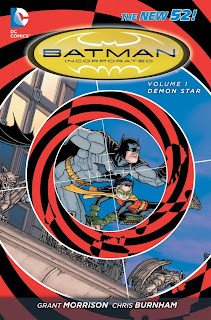 The seven-issue Batman, Inc: Demon Star begins with three relatively self-contained chapters. The first was the title's Zero Month issue, which for me -- as a fan of Batman, Inc.'s more international territory (and with art by Frazer Irving) -- might have actually been the best of the lot. The second chapter (issue #1) generally introduces the cast and the Leviathan threat (but even the significance of "Demon Star" is something already established in the last volume); the third chapter (issue #2) is a twenty-page profile of Talia al Ghul, which weaves liberally in and out of established Batman lore. Nothing wrong with Grant Morrison writing a Talia spotlight necessarily, but at this point we're three issues in and for the most part in exactly the same place as we were at the end of the last volume. The four-part main story begins with Morrison reintroducing Batman's alter-ego Matches Malone, enjoyable itself, but a series of events quickly leads to Leviathan kidnapping Batman (all part of Batman's plan, as is Morrison's wont) and Batman and the Incorporated crew having to fight their way out of Leviathan's "kill box." The story is essentially a four-part action sequence -- but actually, make that three issues, because Morrison uses one of them to visit the future Damian again. This is perhaps supposed to be the "big reveal," the apocalyptic situation Batman is trying to prevent, but I found it a little bit of a let-down -- more tragic apocalyptic scenarios I think we've seen. Now the reader is left with just three main, present story issues, which again are mainly an action sequence. There's nothing wrong with action per se (and those who complain Morrison's stories might be "too cerebral" shouldn't have much to fault here) but this kind of pitched battle seems better suited for the actual conclusion, after more build-up. More significantly, Batman, Inc. is only fighting Leviathan's minions here, not Leviathan; the fight feels like a fight for fight's sake, again like filler, rather than something that's really moving the plot forward. My discontent is exacerbated by the fact that many of the dangling threads from the previous Batman, Inc. volume aren't addressed here. At one point Batman shows an image of Leviathan's "web" that includes the Spyral organization and former Batwoman Kathy Kane, among others, but the story delves not at all into any of that (nor does current Batwoman Kate Kane ever appear here). Morrison does reveal the identity of Inc. member Wingman, though even this too is a tad muddled, in that the characters seem to be referencing events of Morrison's Batman and Robin series while ignoring some of the character's more recent New 52 appearances. What largely helps this book is first, the strength of Morrison's writing -- there's all sorts of cute and irreverent bits here, and indeed Morrison choreographs some great action and demonstrates well the threat that Leviathan poses (the part where the hulking Batman throws the boulder down the stairs was horrifying!). Second is that artist Chris Burnham really makes Demon Star his own, perhaps even more than the previous volume, with frenetic images that are just this side of cartoony, while also populating Demon Star with buckets and buckets of blood. Demon Star emerges as a strange amalgam of Batman and Mortal Kombat -- heads snapping back and blood flying from wounds -- that turns Batman, Inc. into something else, something odder and more nightmarish than Morrison's stories so far, though with shades of Batman and Robin. In parallel, Morrison and Burnham are at times hilarious, punctuating a joke simply with the look on Batman and Robin Damian Wayne's faces. In all, Burnham gives the book a jukebox, circus feel that endeared me to the book even as the plot puzzled me. That goes a long way toward keeping the book from being "forgettable" even I tend to think the real story won't start until the final volume. I have adored certain volumes of Grant Morrison's long Batman run, but here at the end, unfortunately, Batman, Inc. Vol. 1: Demon Star isn't one of them. It's all over but the waiting, now, and maybe the upcoming second volume will redeem the first. Later this week, our review of the final Blue Beetle collection. Don't miss it! I don't try to assign roles to each Batman title. Every book has action, every book has mysteries, every book has crime, every book has villains, and so on. So I don't try to categorize that. For me, its just about the creative teams. "Batman" is Snyder's book, "Batman and ..." is Tomasi's book and "Inc" is Morrison's book. Thanks for your thoughts, Spooky, and glad you enjoyed this one. We're definitely together on our admiration for Burnham. I still love this series to bits, but this volume does feel more straightforward than you'd expect from Morrison. It's like he's in full pay-off mode, with no room for fancy tricks, and it makes me wish DC would collect this whole "season" in just one (preferably oversized) hardcover instead of splitting it in two volumes. Collecting the entire New 52 Batman, Inc. run together would have gone a long way toward improving my opinion of this initial trade, I think. The problem I had was this book didn't feel complete in and of itself (and mostly repeated the last volume); that might have been alleviated with the conclusion in tow. I only read the first volume, so I still have some catching up to do. I'd love to read this volume, I'm sure Chris Burnham must have some really amazing pages there. Did they by any chance include the recalled pages as an extra in the back? I think it was issue #4 that was recalled but I'm only guessing. There are not any extras in this volume, surprisingly, except for the variant covers. I believe the issue you're referring to is issue #3, and if I understand correctly, DC only delayed the book due to its proximity to the Aurora shootings, not changed anything in the book once it came out. I'm pretty sure the image in question was a character pointing a gun at the reader, and that's still in the trade. Actually you're totally right, I think I may be mixing it up with #8 (the small changes they made to the art).